No sea stories for the month of July and June. We didn’t get a chance to get underway in either month. July was recorded as the cool July in several years. Hurricane Arthur made landfall on over the Shackleford Banks, between Cape Lookout and Beaufort, North Carolina, at 11:15 p.m. EDT Thursday as Category 2 Hurricane. The only good news was that it was a fast moving storm (traveling at 13 knots) and had compact eye. The radius of the eye was only 24 miles. So it didn’t do much damage to the Oriental area. I took Wednesday (2nd of July) off to secure the sailboat. I took down all canvass, the jib, and secured the deck. Independence Day weekend was clean up after the storm. Beside, I had to work on Friday (Independence Day) so it was a regular weekend for me. We drove down after work on Friday. The following weekend, Michele and I went a tour of HandCrafted Home in Henderson, NC. It was interesting how they put the module homes to together and build them. The weekend after that, I was call and had to remain home. The last weekend of the month, Michele drove to Jersey to attend her 40th Class Reunion at Sayreville High School. It been one down pour after another in Oriental the week leaving up the reunion. The total rain fall for the month of July is over 6 inches. Therefore no sea stories to tell. A matter of fact, I haven’t place the the jib back on. It is still folded up nicely in the forward cabin. I went down to DAS BOOT to check up on it, while Michele was in Jersey. Beside the down pours and no wind, the only thing I accomplish was to wax on and wax off. 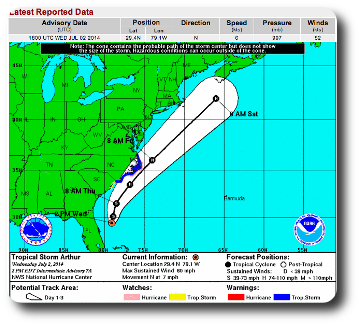 2014-07-02 1400 Hurricane Arthur update. 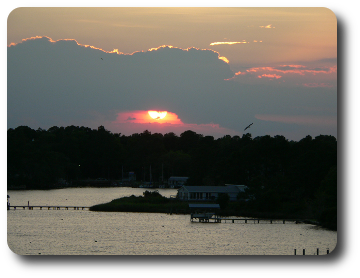 July 28, 2014 in Oriental-NC, Sailing.